I'm not really a fan of the costumes from the 2004 POTO movie. 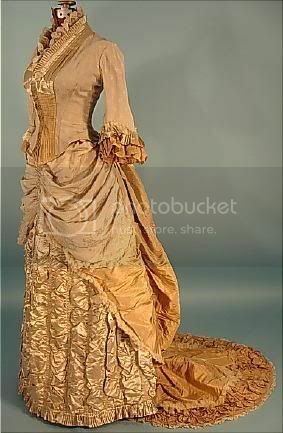 I think they did little for the story telling, and I think they were too old-fashioned for 1870's Paris. 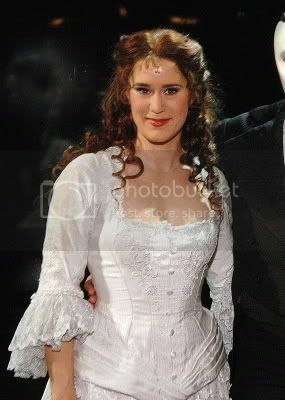 But Christine's wedding dress is lovely. I got to see it up close when displayed in London, and I liked the use of materials. It looked somewhat antique. I also got to see three different stage wedding dresses from the Copenhagen production in 2003; one which came from Sweden, one which came from Belgium and one brand new dress (identical in materials to the one Rachel Barrell wore in West End, as it was made in the same UK workshop). They were all a tad different and very beautiful, and again I loved how they had this antique feeling to them. 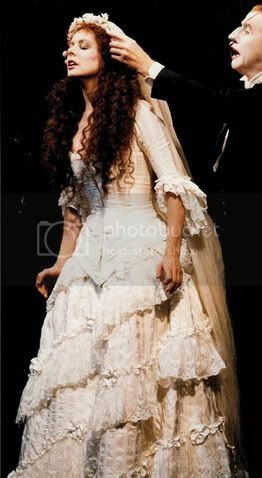 I'm also drooling over Sarah Brightman's original West End costume, Rebecca Caine's dress used in Toronto, plus several German versions. Last but not least, I've glanced towards historical items, some of which are displayed in the gallery underneath. The stage costumes appears white on stage, but backstage they all have various nuances of cream and silver. This is partly due to the stage lights - an all white dress would appear with a blueish teint, while the warm nuances makes it appear white on stage. The lace and appliquées also adds texture and depth to the surface. I've tried to copy this into my own replica. 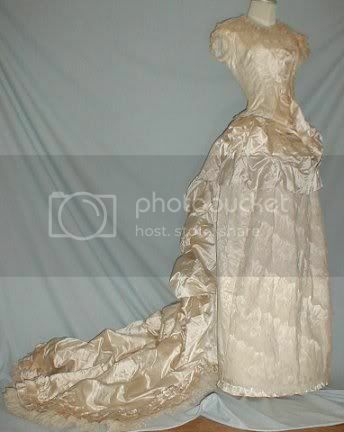 Dresses from the 1870s and 1880s, reminding of the POTO wedding dress. 1. 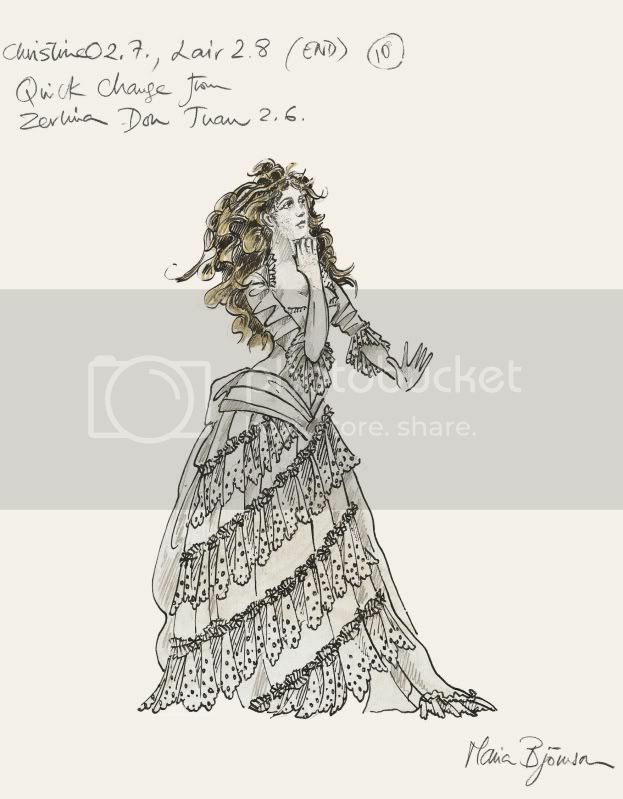 Maria Bjørnson's design for Christine Daaé in wedding dress, 1986. 2. 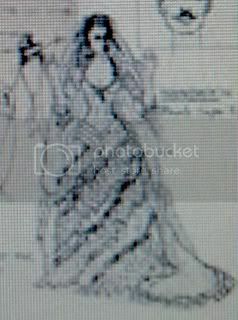 Maria Bjørnson's design for the Mirror Bride, echoing Christine, 1986. 3. 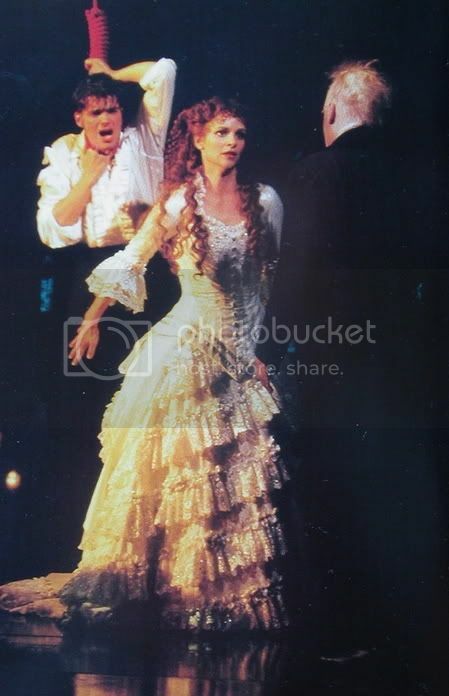 Sarah Brightman in West End, 1986/1987. 4. Susanne Elmark in Copenhagen, ca. 2001. 5. Anne Görner in Essen, 2006. 6. 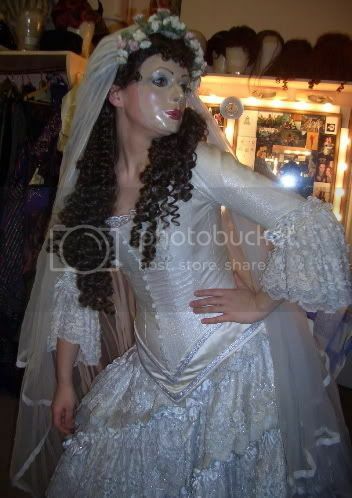 Belinda Evans as Mirror Bride in West End, ca. 2007. 7. Close-up of skirt from Canada, as worn by Rebecca Caine ca. 1989. I bought a quality cream satin for the skirt. It has an almost champagne tone in it, and is thick and nice satin, a true quality fabric. The construction of the skirt is also quite simple: two large triangular back panels, and one smaller triangular front panel. 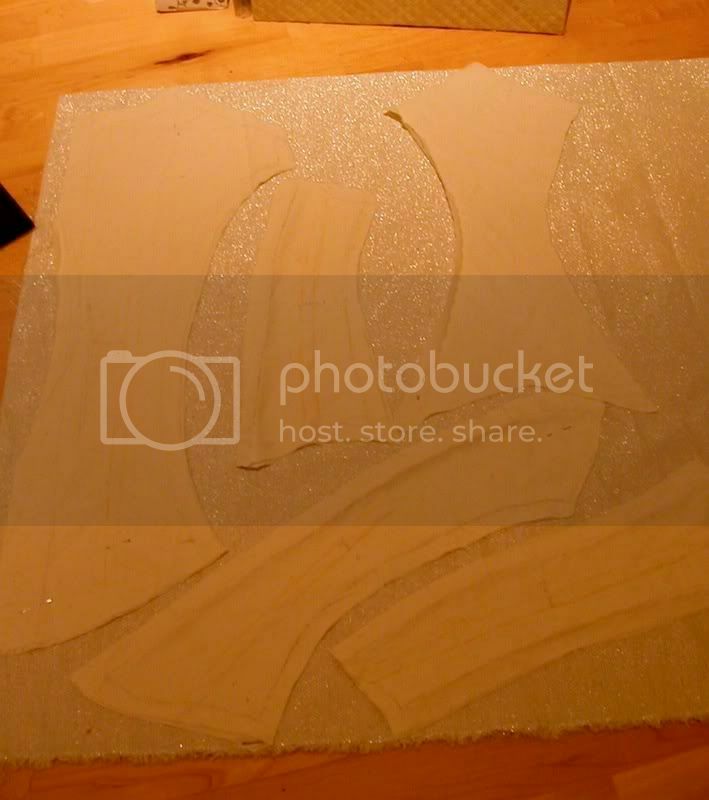 So of course I had to screw up by not mirroring the back panels when constructing the skirt... yeah. By patching the pieces together I managed to get two full backpanels, and I think the seams will be covered by the backdrapes and the laces. I am pleased with the skirt as it is now anyway, as it have a nce bell shape, and I am very happy I didn't have to scrap that fine fabric. The train is a bit exaggerated, but I've always dreamed about a dramatically trained skirt and is quite happy with the current look. Non-mirrored skirt panels (ach! ), and the rose lace before being gathered. The skirt was gathered in the waist and stitched to a waistband made out of scraps of the cream satin. It's closed in the back with hooks and eyes. The skirt is not lined, as the satin is rather thick. I will however use an underskirt with a pleated hem later on, to add a bit oomph to the shape. I looked for a suitable lace for several months, but they all turned out to be 1. nice, but way too expensive, 2. affordable, but stiff and cheap-looking or 3. too narrow. But then I remembered the gorgeous lace I used for a custom made dressing gown some months earlier, with a delicate embroidered rose pattern on an organza fundament. When I went back to that store they had around 22 metres again. I bargained a bit and got the whole lot for $60, which is quite affordable by Norwegian standards. The lace was gathered and pinned on in two downward-going spirals (meaning it's continued in the back of the skirt as well). At first I had the lace too full, but when I decided that "less is more" and used only half the amount, the look improved greatly. Various stages of the skirt when adding the lace and the satin ribbon. 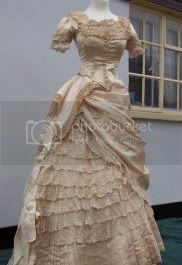 The lace was stitched on and the top covered with a gathered satin ribbon. The ribbon was supposed to be cream, but it was still too white towards the skirt and lace. So I dyed it in hot, strong tea to achieve an antique look. It's a trick I've learned from my dad, and although he use it for photography, it worked like a dream on satin too. At least at the time. As I ran out of satin band I had to get out and buy more. Apparently I bought another kind, which dyed differently. So now it's yellow while the others are cream. It has to be replaced. Meeeh. I started making a cotton toile to get to adjust the seams - something I did a LOT. There are 12 panels in total, and each can be adjusted to create different effects. When I had achieved the desired fit, I cut a double layer of each panel in unbleached cotton, and made vertical seams for boning. It's boned with rigilene, which is semi stiff. The back/side is based on the Hamburg Wishing dress bodice, with curved back seams and room for a bustle. The front is modeled after pictures of various stage versions. 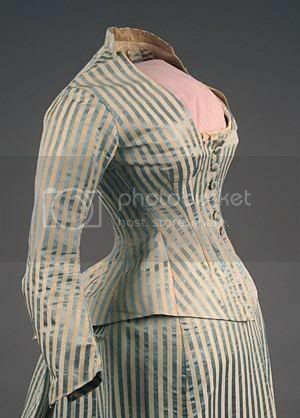 The bodice front is pointed, and the neck opening is rounded. Originally I had 13 buttons in front, but the neckline was a bit high, so I cut it down, ending with 12 buttons. The button holes are hand bound, and the buttons are cream satin ones. It was hard to decide whether to put the bodice closing in the front or the back. I started out heading for a back opening, and cut just one panel for the front. In the actual stage version both front and back closing has been used, though the latter is way more common. The original West End costumes had front closing (small hooks and eyes), but it was soon replaced with back closing (big hooks and eyes). As far as I can tell, all later versions has had the closing in the back (hooks and eyes, or zippers). It makes sense, seeing how going from Aminta costume to Wedding dress is one of the quickest changes Christine do. But Christine actresses have dressers. I don't. And I want to be able to put the costume on myself. So I went with front closing, with two separate front panels. and I made real button closing since my dress isn't a stage costume and will be viewed up close. It also feels more historical accurate, for whatever that is worth. The bodice is made of a gorgeous silk/cotton fabric with metallish threads. It's hard to say exactly what colour the fabric is - from some angles it appears cream coloured, from other angles glittering silver. It gives the bodice a surface adapting to the light, and I like it very much. It was a lucky find on the top shelf at my favourite fabric store, and since I already had the cotton toile I could cut the panels right away. The bodice turned out nice, with two exceptions: I didn't get to iron the seams properly, as the boning was already attached. It is a bit wobbly here and there. Hopefully it'll disappear when worn a bit. The bodice in progress, with various tryout decorations. As for decorations, the stage versions offer several options. The most common ones are mirrored appliquées and lace "fans". Sometimes a combination is also used. I'm using mirrored white appliquées with pearls and sequins for the bodice front, just over the bust. The neckline is embellished with a cream lace with embroidered flowers. This lace was unpicked from one of my grandmother's underskirt from the 60s! It's as synthetic as can be, but has a nice colour and texture. I trimmed the scalloped outline with pearls, gathered it lightly and stitched it to the inside of the neck opening. One thing I want to try out is to make a basque where the fabric is pleated over the hips, and ending in a bow in the back. I'm inclined to think that the costume sketch shows this. Newer European versions don't have a pleated basque; instead they use a basque with two horizontal metallic ribbons attached. One exception is the German dresses, which I quite fancy. It's also what the American, Canadian and Australian costumes has. They have the pleated basque and the bow as separate pieces, which probably is a lot easier to deal with. I might end up doing this if the "one piece idea" fails. But at least I'll have a pleated basque. The sleeves are made of the same fabirc as the bodice, but lined with polyester to make them easier to get on and off. I don't know if it's a bodice or sleeve issue, but even after multiple mockups I just didn't get the sleeves right. In the end I decided that mediocre sleeves are better than no sleeves. They don't fit quite right in the arm hole, but I just don't care anymore. It blocked the whole energy of the project, and I had to continue if I were ever to finish it. I am, on the other hand, very happy with the lace cuffs. I didn't have more of the rose lace I used for the skirt, but I found a fabric which was almost identical to the one used in the UK in the early 2000s. There are some distinctive raised flowers on the Uk lace which is also found in my fabric. The pattern underneath and the scalloped outer line is different, but they're similar enough still. I cut the engageants shorter in front than in the back. I also cut an identical out a layer of a glittering lace to add underneath. They were placed on top of eachother, the top folded in, and gathered. I attached the engageants a notch higher than where the sleeve ended, and added a silver ribbon a bit down so the gathers are viewable. After sewing it down with sewing machine, I added glittering sequins and pearls on top. Whereas the upper sleeve is a fiasco, the lower sleeve rocks! Guess I have to be happy with that. The sleeves in making. 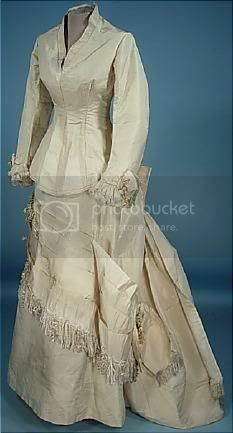 The first picture shows the sleeve of a UK made wedding dress, worn in Copenhagen.